I struggled for a while with this installation, so leaving a trail here for anyone looking. 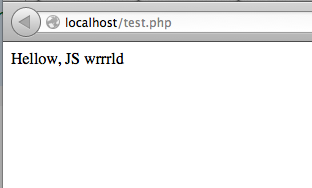 Goal: run JS code inside a PHP script running on a webserver. Already accomplished: Macs come with a webserver (Apache) and PHP. Step 1 is the tough one. You need to install the v8js PECL package. So first you need to install PECL. To install PECL, first you need to install PEAR. V8JS only works with v8 up to a certain version. So you cannot install the latest v8. Oh, and the easiest way to install v8 is to use Homebrew. So the path ahead: Homebrew, v8, downgrade v8, pear, pecl, v8js, config php and apache, hello world! You might already have v8. But it's probably the latest, you need to downgrade. UPDATE: Nov 10, 2014: brew versions is no more. But no bother, skip the versions command and use the git checkout... below. $ sudo vi /etc/php.ini # include_path = ". :/usr/lib/php/pear"